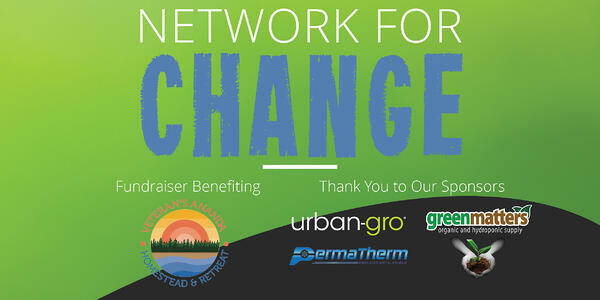 Lafayette, Colo., (March 19, 2019) – urban-gro, Inc., a leading agricultural solution and technology company that works with commercial cannabis cultivators around the world, announced that it will be co-hosting Network For Change on Friday, March 22 from 5pm to 8pm to benefit Veteran’s Ananda, a veteran-founded, nonprofit organization that assists with the rehabilitation of service members and first responders. The event will be co-hosted by Permatherm and Green Matters and take place at Back Bay Social in Boston, MA in conjunction with the NECANN cannabis conference. Funds raised at the event will have a critical impact on the completion and transportation of four tiny homes to house veterans on the 22-acre property where Veteran’s Ananda conducts workshops and retreats. Veteran’s Ananda offers a unique, individualized therapeutic approach to care, incorporating public and private healthcare resources to help veterans with their post-traumatic growth and beyond, including job placement and certification and licensure programs. According to national statistics, the resource and mental health needs of returning veterans are significant. Veterans are at two or fours times higher risk of major depression and eight times higher risk of Post-Traumatic Stress Disorder, while only half of veterans seeking mental health treatment receive minimally adequate care. More information on the Network for Change event can be found here. urban-gro works to support community and nonprofit organizations through the “urban-gro Cares” program and urban-gro experts will also be on hand at the NECANN expo in Booth #227 to meet with cultivators and answer questions regarding urban-gro’s systems integration solutions, products, and technology. PermaTherm's core competency is the application, design and manufacture of insulated metal panels and accessories for the low-cost construction of highly thermally-efficient metal building systems, including commercial, food, agriculture, pharmaceutical, retail and even zero-energy residential applications. Our insulated metal panels are versatile and are suitable as a cost-effective, thermally-efficient alternative to brick, wood, cinderblock or bare metal sheathing over a steel grid. Additionally, our modular sandwich panels are customizable, using high R-value polystyrene cores with a variety of steel skins for tailor-made metal building systems. Green Matters is not just another hydroponic shop. Green Matters is a veteran owned business that is here to provide the community with quality up to date information on products and growing techniques. We have a small family business attitude with big business knowledge and competitive pricing. Your success is our success.